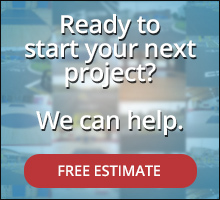 Why Indoor Floor Markings are Important | Brite Line Paint Co. Inc.
Indoor floor markings are important because they designate areas and mainly for safety reasons. Take a warehouse, for instance. The striping on the floor represents something. In many cases, it represents caution, a trash compactor area, or an area where forklifts may be operating. Forklift lanes may be something that is designated or even an area where pallets or other items are to be stacked. Prepare the concrete surface – This is the first step of the process and a very important one. Just like a piece of wood that needs to be sanded before painted, concrete has to be prepared. Before any sort of paint is applied, the concrete needs to be etched with a shot blaster so that the smooth finish that is currently on the floor is removed. This creates a surface profile that the paint can adhere to. If this step is skipped, then the paint is likely to fail. The appropriate paint is chosen – Choosing the right type of paint is a very important step in the process. If the appropriate paint isn’t used, then the markings will not go down right and they won’t stay down. 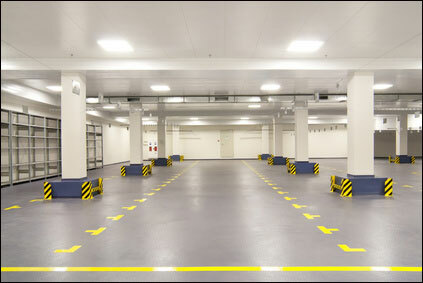 Epoxy is typically the type of paint that is used for warehouse and other indoor environments. It is a less expensive option, but it also stands up to heavy forklift traffic and the wear and tear that occurs from other heavy equipment and the movement of pallets. Sealant application – After the markings are put down properly, the lifespan of the paint can be lengthened. While the sealant step is not as important as the first two, it will protect your investment. The sealant is transparent and adds a layer of protection over the painted area. This is a step that will be completed 24 hours after paint application. The warehouse floor marking and floor restriping process may seem simple, but it does take a great deal of professional care to ensure that it is done right. The goal is to do it right and minimize downtime as much as possible. There are some situations in which indoor floor markings cannot be done. Some of those reasons include a property owner that doesn’t allow painting or etching within a warehouse, there are food products in the warehouse that cannot be exposed to fumes, the warehouse needs their floor marking configurations changed frequently, the warehouse cannot have any downtime at all (although that can be minimized as much as possible) while paint dries, or the warehouse has a cold environment that isn’t ideal for paint applications. These are reasons that can apply to virtually any indoor environment in which floor markings are needed. One alternative, however, is floor marking tape. These tapes are cost-effective when one of the above challenges exist. The tapes are available in different grades and colors so that specific needs can be met. If floor logos are needed, those can also be made in tape material. The best way to know the type of tape that the warehouse needs is to consult with a professional. This will ensure that the correct tape is selected and that it is laid out properly. And because a professional crew is efficient, the downtime is kept to a minimum. Depending on the operations within the indoor environment, there are times when downtime is hardly noticeable. Whether you are looking for a long-term solution or something that meets your needs, it can be done. Indoor floor markings are important for a wide range of indoor environments. They enhance safety, they tell individuals what is going on, they ensure the flow of traffic, and so much more. As opposed to a bare floor, floor markings can be a great asset in minimizing injuries and even keeping things organized. It’s an investment that can pay for itself time and time again whether they are painted markings or tape markings. If your indoor environment is in need of indoor floor markings, Brite Line Paint Co. can help you. We have helped companies in New Bedford and beyond establish the markings needed for efficiency and safety. To learn more, call us at 508-678-6775 or fill out our contact form.